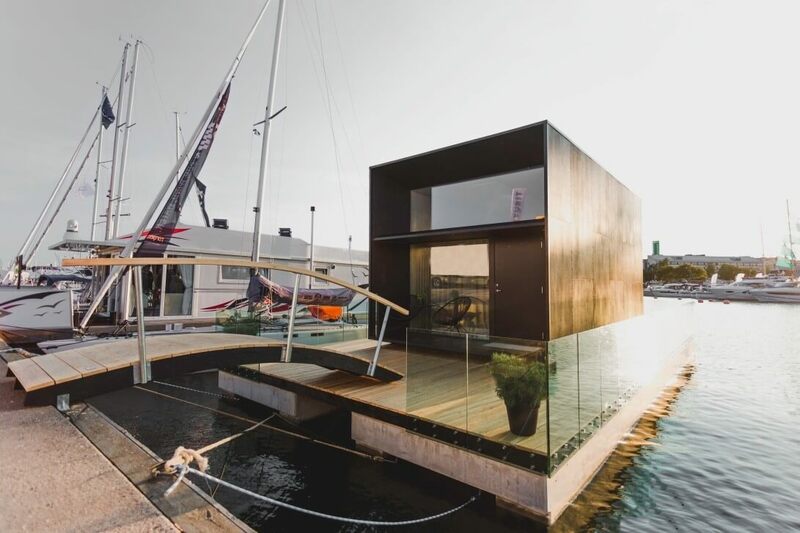 The new cooperation between Kodasema, innovator of housing and living solutions, and Top Marine, designer of marina solutions, results in KODA Light Float that integrates the house in floating pontoons enabling extended waterfront properties. Helsinki, Finland, August 16, 2018 – The KODA Light Float opens up the opportunity of using urban or countryside waterfront space. The architecture, design and engineering skills combined enable living near a favourite yacht harbour, on a private lake or on an urban canal. The versatility of modular housing concept makes the KODA Light Float either a harbour café, artist’s studio, not to mention a summer retreat or a fisherman’s dream. With its spacious comfort and high ceilings, the fully equipped tiny house has a facade-sized illuminating window. The floating KODA house gives an atmosphere of a mediterranean villa. Sustainably finished with plywood inside, the KODA Light is as minimalist as it is cosy. The floating terrace creates even more luxury space to be blend into the favourite surroundings. The KODA Light Float is presented and available for purchase at the Helsinki Sailing Club on August 16- 19, 2018 during UIVA–the largest in-water boat show in Finland. The production time for KODA Light Float starts from 3 months. Kodasema OÜ is a design and engineering company that creates innovative living and housing solutions. Their movable KODA houses function as homes, hotels, cafés, studios, community spaces or even business hubs, while being produced off-site with uncompromising speed and quality. Top Marine OÜ is a leading designer, manufacturer and installer of floating marina solutions in the Baltic States and Nordic countries. Their production line includes swimming pontoons, access bridges as well as moorings and mooring fingers.